In his late twenties, ASC Enterprises Ltd's group president and CEO Punit Goenka is not one of those high-profile, page three-type executives. Surprising, because he heads a company that has a planned outlay of about Rs 16 billion and also happens to be the eldest son of Subhash Chandra, who was hailed a few years back as Asia's Rupert Murdoch. The son of the promoter of ASC Enterprises Ltd prefers to keep a low profile, a complete antithesis to his father. If he were to walk into one of India's celebrated restaurants, it is unlikely that he would cause even a raised eyebrow. Simply because very few photographs have appeared in the media of Punit or PG, as he is generally referred to in the company by his colleagues. 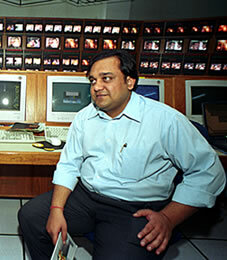 So much so that when indiantelevision.com's photographer tried taking some shots of him at Zee's Noida-based DTH and HITS facility, Punit almost wanted to melt away and it was only after great persuasion that he agreed to be photographed because as he says, "I am a small guy who is more comfortable behind the scenes." Probably that is his way of maintaining his freedom to move around anywhere without being bothered by the paparazzi or the TV crews, always on the look out for some celebrity or the other like Subhash Chandra. With an entrepreneurial background, PG pursued his early education in Switzerland and attained his Bachelors degree in Commerce in Bombay (1995). Since December 1997, he has been involved full-time in ASCEL (ASC Enterprises Limited) where the company's vision is to be a pre-eminent provider of a full range of high quality and cost-effective satellite mobile, multimedia and broadband services and capacities. Before becoming the group president and CEO of ASC Enterprises Ltd., PG was vice-president, co-ordination and operations when former telecom man JP Singh used to be the company's CEO. The media shy Punit Goenka speaks to indiantelevision.com's Anjan Mitra in a rare interview. How would you view ASC Enterprises at the moment? ASC Enterprises has interests in several areas of convergence like radio trunking, satellite operation and retailing of related products. I see ASCEL growing and in the future would become a major business for the whole Essel group. At the moment, out of the several subsidiaries of Ascel, only two, Agrani Convergence Ltd and the Agrani Satellite Services Ltd seem to be in the active mode. What about the others? It would be incorrect to say that only these two subsidiaries are active. The other businesses of ASCEL like the radio trunking venture too, is functioning well, but the two mentioned may be the more high profile ones. Moreover, Agrani Convergence Ltd (ACL) is undergoing some restructuring and that is why it may be in the news. What sort of restructuring are you effecting in Agrani Convergence Ltd , which dabbles in retailing of TIME (telecom, information & learning, media and entertainment) products through Agrani Switch stores? First, there are some changes in the management of ACL and we have brought in Arvind Narang as the chief operating officer, in place of Pankaj Mahindroo who was the CEO earlier, while I have taken the position of executive vice-chairman in the company. Second, the business portfolio is also undergoing some changes. Earlier, at ACL we were doing five to six businesses like catalogue sales, institutional sales, distribution and servicing. But now I have rejigged the businesses to focus on just three to four segments of retailing of TIME products, distribution of telecom handsets and servicing that will involve after sales services and maintenance work. We have already set up a call centre in Mumbai and another satellite centre will come up in Delhi soon. We have taken care of the logistics and have taken warehousing facilities in Mumbai and Delhi. The next step is to fill in the slots for the various links of the distribution chain. Do these changes mean that earlier plans like assembling of PCs and selling them under the Agrani brand have been dumped? Well, those plans have certainly been put on the backburner as this financial year I plan to get ACL back into black from red. "I have rejigged the businesses to focus on just three to four segments of retailing of TIME products, distribution of telecom handsets and servicing that will involve after sales services and maintenance work"
Have the changes made in ACL started showing some results or is it too early for that ? Some signs of revival are already there since April when we started making the changes, including a change in the management team. In the last two months, we have been doing sales of about Rs 9 crore (Rs 90 million) a month, up from sales of about Rs 3.5 crore in the period before April. ACL has set itself a turnover target of Rs 125 crore for this financial year and I am confident that we would achieve it as we see services contributing in a major way to the total kitty. Is ACL looking at introducing some new products in the market after the business rejigg? We are certainly working on those lines and one of the products that we will bring is giving a warranty scheme on mobile handsets, etc wherein such products would be insured and the customer would have to pay a nominal amount as premium, which we would like to keep below Rs 100 per annum. But isn't such a scheme already being offered by Reliance to its subscribers of wireless in local loop (WiLL)? What will be new in ACL's scheme? Reliance is extending a warranty on handsets that belong to Reliance and the subscribers of its telecom service. Here we are talking about any mobile handset irrespective of the service or the product provider. You come to ACL with your cell phone and after an evaluation it'll be insured for a fee. If the cell phone has been purchased from Agrani Switch stores, then the premium may be as low as Rs 50 per annum. But the older a handset is, more the premium would be charged for its insurance. "For the present we are not looking at offloading any more shareholding as we don't want to sell the equity cheap"
Does ACL have to tie-up with some insurance company for this and when is this warranty scheme being launched? We would launch this scheme over the next three to four months and at the moment the evaluation process for a partner is on. We are looking at some international companies, including those based in Europe and Asia, which are into insurance of only such electronic goods. One of the core business components of ACL is the Agrani Switch stores that have not been doing well. How do you plan to revive these stores? Before I talk about revival plans, I must say that we are looking at increasing the Switch stores to 100 from the existing 50. Having said that I must also add that the whole approach to the Switch stores is being restructured. The idea is to make them more cost-effective and smaller in size, instead of huge stores that are unable to recover even the rental of the real estate. The stores have to be smaller and cost effective as the margins on products is low, which may range from five per cent to 40 per cent. In the TIME related accessories, the margins are certainly high. Will ACL also undertake the distribution of set-top boxes that would be needed for conditional access and Zee's proposed DTH service ? Well, there are certain synergies and we may look into that aspect also. However, at this moment, it would be difficult to commit anything on those lines. Why did the high-profile CEO of ACL leave or was he sacked? To leave the company was a decision of Pankaj Mahindroo. How is the radio trunking business doing? It is a niche business that is doing okay. Nothing spectacular. Moreover, seeing the current telecom scenario, we have put on hold plans to launch digital services where we operate the radio trunking service. It's a small, profitable and stable business that yields a turnover of about Rs 50 crore per annum. At the moment the satellite project is a top priority for us. So, that means things are hotting up at Agrani Satellite Services Ltd (ASSL)? Some developments are happening and would take a bit of time to be unveiled. What would happen to ASSL's Agrani satellite project as the Indian government is insisting that for DTH services Indians satellite will have to be used? Zee and other group companies are potential customers of ASSL, but not the only ones. There are other companies that would need satellite capacity for various services. Agrani would get business from such companies, apart from the likes of Zee. What is the current foreign holding in ASSL and is the company looking at offloading more holding to foreign companies? The foreign holding in ASSL is less than 26 per cent wherein both Alcatel and Arianespace together hold 13 per cent, while we have made some investments through overseas corporate bodies that amounts to about 12 per cent. For the present we are not looking at offloading any more shareholding as we don't want to sell the equity cheap. To build up the equity we have to establish the business that is being done now and will gain momentum after the launch of the satellite next year. Are there any plans to take ASC Enterprises public? There are no such immediate plans. Lastly, where do you see the ASC Enterprises subsidiaries one year from now? Businesswise all the three entities should be generating more and we would be close to launching our satellite.